Mom Taxi Julie: I'm tired peeps! Anyhow, most everything was done this morning but my room. So I got up and started cleaning. Scott eventually decided that he was going to mow the yard. Next thing I know he's changing the oil in my car? and fixing the brakes? Eventually he got around to mowing. Then he comes in and tells me he just shut the water off because something on the hot water heater was leaking. I'm standing there in my nightgown because I don't want to get dressed until I'm done sweating, not to mention I'm CLEANING and will have to wash some dishes AND people are coming over??? Yeah so he went out and turned the water back on. I must have looked kind of scary. So I worked right up until time for people to get here. Everyone seemed to like my house, loved my walkway and they all liked the book that I had picked. 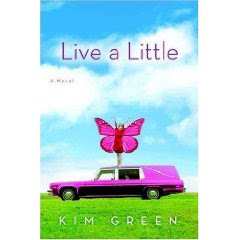 Live A Little by Kim Green. Free for posting a comment, I'll pick a winner on Friday! Green's third novel displays a charming, acerbic wit unfortunately employed in the service of an unlikable character. Raquel Rose finds her diagnosis with terminal stage IV breast cancer to be unfair: she put her artistic dreams on hold to raise two kids and now she'll never become the sculptor she always wanted to be. Life after diagnosis isn't all bad, though: knowing she has only months to live, Raquel agrees to go on Living with Lauren! her sister's Bay Area talk show; her husband turns from couch potato to pink-ribbon activist; and her two sullen teenagers start confiding in her the way they never did before. But when a follow-up visit to the doctor reveals Raquel's biopsy results were switched with another woman's and she's actually cancer-free, she can't bring herself to fess up and lose all the local celebrity perks cancer has brought her. The lies snowball in sometimes funny fashion, but Green unfortunately doesn't bring any gravity to Raquel's quandary. Instead the gambit is played as ditsy and vapid. (Aug.) ""
So now my house is all clean. I've already ordered my book from www.paperbackswap.com and now I think I need a nap. The books sounds pretty good. Did you enjoy it? Glad the water could be turned back on! 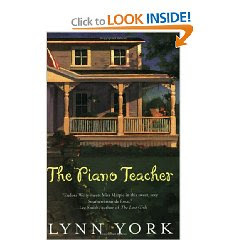 You have done a wonderful job of your yard, I'm not surprised your book club visitors liked it! ME! ME! ME! Pick ME!! I can't see how you can just jump out of bed and start cleaning. My head hurts just thinking about cleaning. I'll be here waiting for my next winnings...lol!